Butter and flour a cake tin, and line the base with baking parchment.Arrange the cherries over the bottom of the tin, and sprinkle 1/2 cup of the sugar over them. Beat the butter and remaining sugar together until pale and fluffy then add some of the egg, beating it in well before adding some of the flour and more egg and continue beating. Add the remaining flour and egg alternately beating each addition in well before adding the next; add the vanilla essence with the last addition of egg.Pour the cake mixture over the cherries and sugar, and smooth it level with a spatula if necessary.Bake in oven for 25-30 minutes until risen and golden and just beginning to come away from the sides of the tin. It may not need quite as long if it is in a fan oven.Remove from the oven and allow to cool for a couple of minutes.Place a large serving plate over the tin, and carefully invert it. Serve warm or at room temperature with crème fraiche or with whipped cream. some yummy recipes! 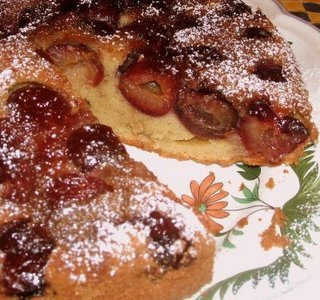 I do something similar to this cherry cake, but with plums. Not in season now in Northern Hemisphere, but good if you have your own home-preserved or frozen. saw your comment on chocolate - see my blog.